Hannah Cho, 15, is a sophomore at Professional Children’s School. 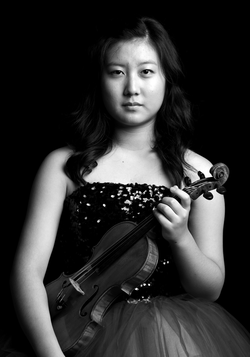 She currently studies at the Juilliard Pre-College Division with Cho-Liang Lin and Masao Kawasaki. Hannah has won many competitions nationwide and performed in various cities such as Boston, Philadelphia, New York, Salt Lake City, Aspen, Hawaii, San Diego, and Los Angeles. Most recently, Cho appeared on From the Top show at the Kahilu Theatre in Waimea, HI. In December 2009, she was the youngest participant of the New York String Orchestra Seminar and performed at Carnegie Hall twice during the ten-day seminar. Hannah was also the youngest winner of the 2009 La Jolla Symphony Young Artist Competition and is scheduled to perform the entire Prokofiev Concerto No. 2 with the symphony next season. She has performed as a soloist with orchestras and has participated in many master classes, including the Coaching Workshops at the La Jolla Music Society SummerFest and with Gil Shaham at the Aspen Music Festival and School. Hannah aspires to become a world-renowned soloist and loves how music can communicate with people in a special way that words cannot express.